I don’t hate atheists. I don’t like arguing for the sake of arguing and don’t have a ‘thing’ about winning a debate. I discourse with atheists because I love them, and because I believe that I am right in my belief that God is going to call this world to account and if we do not have Christ as our advocate, we’re toast (And Christ stands ready to be our advocate the moment we’ll let him). I am happy to have had the honor to have corresponded with the recently deceased Antony Flew. 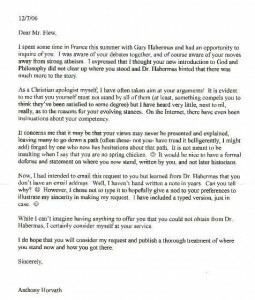 This correspondence occurred after he had abandoned atheism and before it had become publicly known that he was going to write a book documenting his conversion.